Philosophy has launched Amazing Grace Magnolia, a new flanker to Amazing Grace. Indulge in the latest addition to philosophy's fragrance family: amazing grace magnolia. This eau de toilette spray is a breathtaking woody floral musk with notes of bergamot, delicate magnolia, and white nectarine, grounded with warm musk, driftwood, and solar amber. 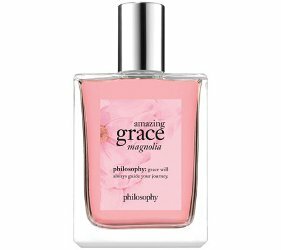 Philosophy Amazing Grace Magnolia is available now at QVC, in 60 ml Eau de Toilette, $49.